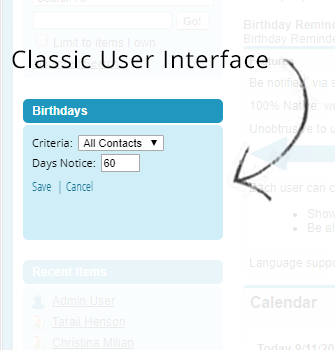 Contact birthdays in the Salesforce UI. Live Preview Try It - Free! The compact design of this application allows for unobtrusive notification to your team. It is easy to navigate and provides single-click access to the Contact details. Best of all this application is 100% native so it can be installed in any Edition of Salesforce. Global defaults provide initial configuration settings. But each user may tweak the settings to personally display "All Contacts" or "My Contacts". Further personalization allows for display of more or less records at a time. 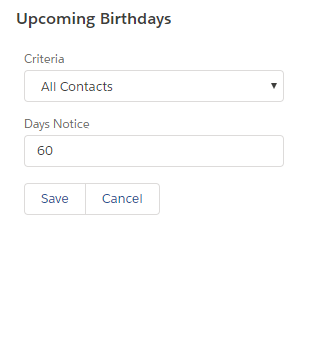 Shows approaching birthdays for Contacts in your Salesforce Org. Works in Lightning and Classic editions. Vertical / horizontal placement in Lightning UI. 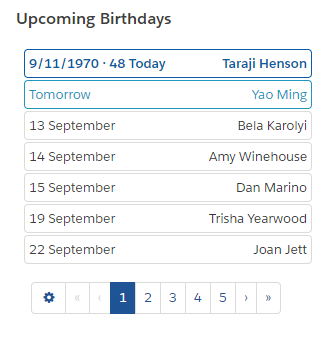 Unobtrusive to users: one-click navigation displays Contact names & birthdates. Each user may customize the application for their own personal settings. Show "All Contacts" or only "My Contacts." Set number of days advance notification. Works with the standard Contact Birthdate field. I have been using the Interactive Ties birthday app for years and I must say it is fantastic. Having my clients birthdays show up automatically is very helpful. I am constantly being recognized by my clients that I am the "birthday card" guy. The clients are always impressed that I write or call each year on their birthday. 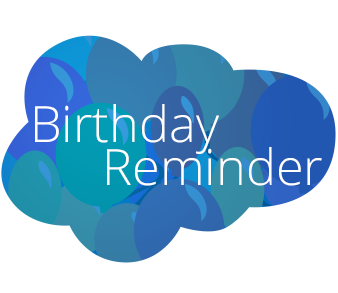 No Iphone, Google, or Salesforce calendar can keep the important birthday info in front of you like birthday reminder app! There are many useful apps but this one is the best for the money if you are in a client driven business. This app helps you look like a winner each day so pay the one time fee and get going! You will be glad you did. First of all, great app. Simple, effective and does exactly what we need it to do. Secondly, support! I had a couple of issues after installing the app. Admins could see it, no one else could. Being new to Salesforce it was clear to me what the problem was. I sent an email to support just expecting an email reply. Well, Greg the developer called me directly and within 20 minutes we had found the issue which was a configuration one on my end. This is an awesome little app. For anybody who hates running reports constantly, this eliminates one report you have to constantly rerun. Any good sales person should know, when someone remembers something about us, it makes us feel good. When someone remembers something about us and then acts on that information by doing something nice, it makes us feel even better! I begin each day by checking salesforce for any relevant customer information that could further or even CLOSE a sale! That's where birthday reminder comes in. Before, Birthday Reminder, I had no efficient or reliable means of remembering birthdays. Now - not only do I remember to send my customer's a greeting on their birthday or a card days before, I've stopped forgetting my brothers and sister! Seriously, unless you have a computer for a brain - get this app! It's a winning sales tool! In sales it can sometimes be the small things that make you stand out. My clients are sometime surprised when I know that their birthday is coming up or just passed. An approaching birthday sometimes gives me a reason to reach out to them and I believe this leaves a good impression. The simplicity of this app is what makes it so great. I love this application. We've got a list view and a report that we can use to see birthdays. It works but we rarely remember to use them. With this application we can see the birthdays as they approach without having to do any additional steps. Hopefully, we'll never miss another clients' birthday. Trusted IP Ranges allows you to easily whitelist IP addresses!